A thorough investigation of the rich and difficult context surrounding Václav Havel’s The Memo. Featuring Paul Wilson, Dr. Lily Gardner Feldman, Dr. Jana Kopelentova-Rehak, and Frank Rehak. Moderated by Baynard Woods. * Though the symposium is a free and unticketed event, your RSVP is appreciated. Please email bfeldman@singlecarrot.com to let us know that you’re coming. A panel discussion about the origins, history, and contemporary reality of living and working within bureaucratic systems. Featuring organizational psychologist Dr. Abby L. Mello and USDOT FTA Director of Communications Amy Bernstein. 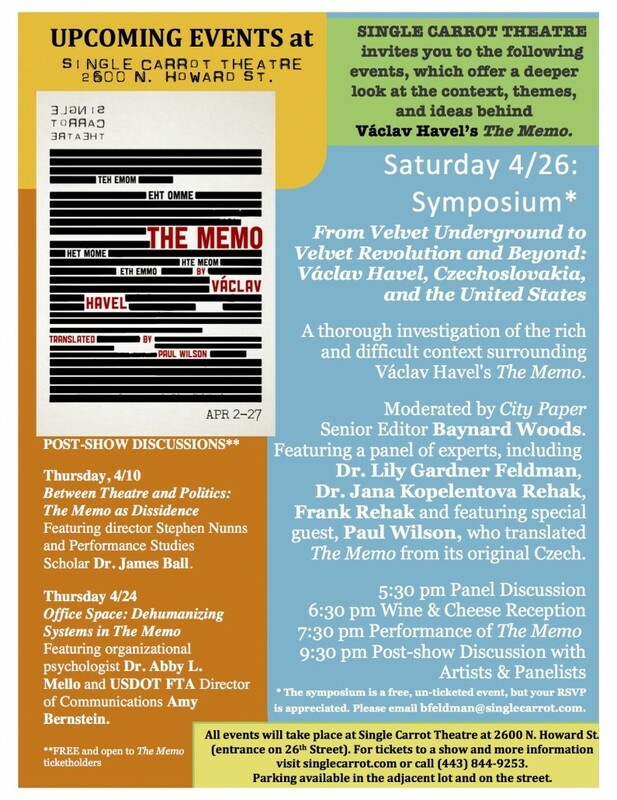 **Free and open to The Memo ticketholders. ALL REMAINING PERFORMANCES FOR THE MEMO ARE SOLD OUT!! You can join the waitlist for any performance by arriving at the box office one hour before show time. You are also still encouraged and welcome to attend the post-show discussion on Thursday 4/24 and The Symposium on Saturday 4/26. All events will be held at Single Carrot Theatre, 2600 N. Howard Street (entrance on 26th Street). For group tickets, email boxoffice@singlecarrot.com.